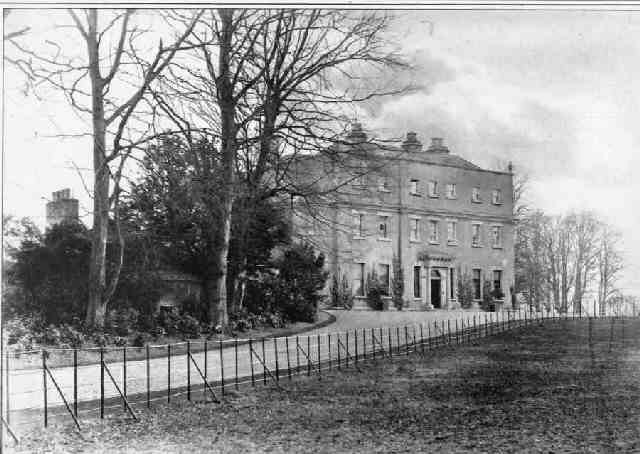 This is a photograph of Randlestown House showing the entrance front. The house was early 18th century begun in 1710 by Mathias Everard. In 1780 a third storey was added and the original entrance front became the garden front being given a pillared Doric doorcase. The interior contained impressive late-Georgian plasterwork. The estate was acquired by Tara Mines in the 1970s and the mine’s tailings pond is now on the estate. The house was demolished. From 1898 to 1938 the Randlestown area of Navan was central to plans to introduce tobacco growing on a commercial basis in Ireland. The industry centred on the 300-acre Randlestown estate, the ancestral home of Sir Nugent Everard. The estate had its own tobacco plantation and also acted as a rehandling station – taking in tobacco from the local growers and processing it for sale to factories. At its peak, the industry provided almost 100 jobs and played a vital part in the local economy. Over a period of more than thirty years, from 1898 to his death at the age of eighty in 1929, Everard devoted his energy, enthusiasm and financial resources to the cause of tobacco growing. After his death the local growers formed the County Meath Co-Operative Tobacco Growers Society. The Co-Operative continued into the 1930s, and closed in 1939, the last year in which tobacco was grown in the county. 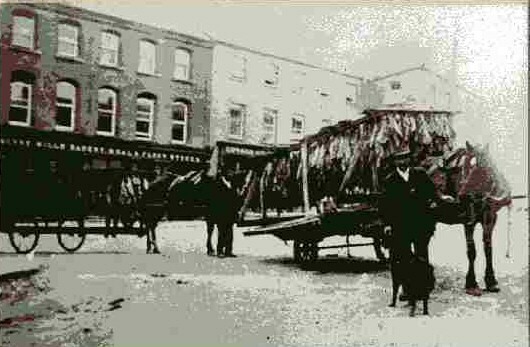 The picture shows two horses and carts being led by two unidentified men on the Market Square in Navan, County Meath. The carts appear to be specially constructed wagons adapted for the job of transporting tobacco leaves. Frames, supported by poles, are raised around the outer edges of the carts. The leaves are hung on the frames allowing the circulation of air around them. Presumably the piling up of leaves on the cart would result in overheating thus damaging the quality of the tobacco.